At the age of 5, he used to hide in the house in order to play the harmonium and sing. As he was growing, just like the boys of his age, he used to run from home to avoid his music teacher and have a game of cricket. But, his father having already spotted the talent in him always brought him back to sing. This encouragement from his parents resulted in him securing the first prize in his first ever music competition. Born on the auspicious day of "Bali Padyami" - 1970, in a music patronising family, Keerti had his initial training from Sri Ramachari Jalihal and Smt.Geeta Gayatri Chakravarthy of Gulbarga. He began his career as a Hindustani Vocalist at the tender age of five, performing in various parts of the Country. He was nine, when he had the honour of singing before Ustad Gulam Mustafa Khan, the renowned vocalist. At the end of the performance, Ustadji thrust his hand into his pocket and pulling out all the money there, presented it to Keerti, with the words "is paise se doodh peyo aur gaate raho" (Drink milk with this money and keep on singing). 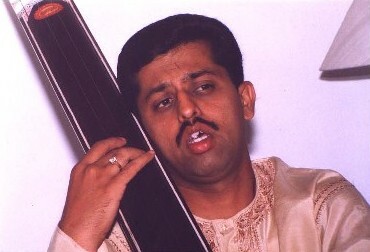 Ustadji had obviously recognised young Keerti's potential. � First at the Inter-University Competition, Gulbarga University, 1992. Karnataka Sangeeta Nritya Academy, Bangalore, 1994-95.
held at Khajuraho (M. P.), 1996. What Keerti cherishes most are the opportunities he has been given to participate in various festivals and cultural events.He has to his credit several performances in festivals organised by the Government and Non-Government organisations. Concert, 2001. He was also the Cultural Representative of Gulbarga University (N.V. Degree College), at the National Integration Camp, jointly orgainsed by the Dept. of Youth Affairs and Sports, Govt. of India; and the Ravishankar University, Raipur (Madhya Pradesh) -1991. Keerti has since been performing not only in various parts of India, but his magical voice has also enthralled the audience in the Gulf Countries. In recognition of his proficiency and to encourage his talent, Keerti has been awarded scholarships by Karnataka Sangeeta Nritya Academy, Bangalore and the Ministry of Human Resources Development, New Delhi, Govt. of India. Keerti is a graded artiste of AIR and Doordarshan and performs often for various radio and television programmes. He was chosen as a playback singer for a Hindi documentary serial "Kotta". Besides, his voice pleased the audience of "Vachana Vaibhava", a Kannada TV serial. He has also sung for many other television serials and documentaries. Keerti has a cassette of Kannada Bhajans "Dasa-Rasaranga" to his credit. Keerti believes in giving back to music all that music has given him. He has several students, ranging in age from 6 to 60. He is working as a music faculty, in an established institution at Bangalore. He is also a dedicated member of the well-known Gururao Deshpande Sangeet Sabha - a registered trust - founded by none other than Pt. Vinayak Torvi himself. Keerti Kumar Badseshi, a performer and tutor who has built a reliable reputation for consistency in both, gave a rollicking start to the festival. One could see that his voice, talent and manner suggest a fine future. As keerti proceeded with the bhadat, the taans seemed to flow with the resonant exactitude. The musical idiom in Bhinnashadj, was as effusive�"
"He developed the raag systematically and sang effectively - Undoubtedly, he has a bright future"
Keerti Badseshi explored the brooding paths of Todi right from the mandra saptak to build an engaging edifice of melody and charm. The descent� won the hearts of a sizable number of his fans"
"His clear accent and deep involvement proved Badseshi to be one of the promising Hindustani musicians of the future. He won the hearts of music lovers with raag Puria Dhanashree and then presented a few Dasarapadagalu (Kannada Bhajans)." " I congratulate you on your ability to groom disciples of Keerti's Caliber. Please convey my best wishes to Keerti.